By Darren Jeffries, January 11, 2008 in Welcome! I live in Tokyo and have fun with N-Scale model rairoad for 20 years. manufactured by TOMIX (in past, "tomix" small text logo iwas used on packages). In this yaer's March, many Japanese Bluetrains is expired. I feel a little sad, most of the lest Bluetrains will be finished with in a few years. and "Twilight Express" - Osaka-Sapporo will remain.) * remarks season train. My favorite is models of KATO, especially JNR models of 1960s to 70s, and JR models of 2000s. I also have TOMIX, MICROACE, KAWAI, GREENMAX and so on. My collection varies from Steam Locomotive to Commuter Train and over 300 sets of train models. MICRO ACE double-decker train JR East E.C. 215 Series "Holiday View Yamanashi". on the Yahoo! JAPAN Auctions anf Rakuten Auctions. Thanks for introducing yourself TSUBAME... it is nice to see you here. hello all on the forum, my main model railway interests are on fast modern passenger trains. I do not go exclusive on any country & my only Shinkansen at this time is a 7 car 500 set from Kato, also from Kato is my 10 car TGV & from Dapol a 4 car Virgin Voyager. Thank you Bernard & Bill for sharing lots of really usefull info, they have given me the inspiration to move my layout from paper to reallity, hopefully get started in May. As you know this is a new forum and welcome aboard! How about some photos of you trains to share with the members? How do you like the Kato 500 set? I don't have any trains made by Dapol I would like to know your opinion on them. Do you plan to use Kato unitrack when you build you layout? Welcome aboard! I know I will have a lot of questions to ask you about the Japanese Railroads. Do you think you could share some of your photos of the "Bluetrain" you talked about in your post? Where did the Bluetrains travel to and from? Wow, 300 trains on your roster, I hope you you will also share photos of them as well. 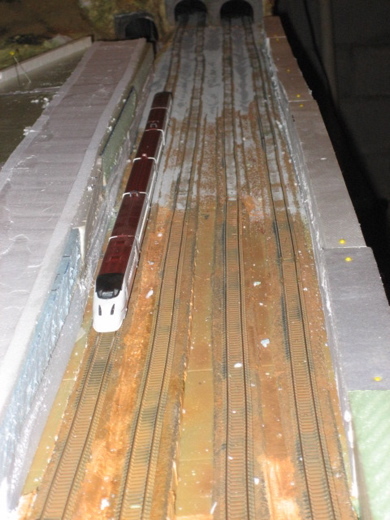 At the present I am working on my own Bullet train layout that I have posted under "Construction" Take a look and feel free to offer suggestions. How is everything going? Have you been able to re-start the layout? It was looking great. I was greatly impressed with the tram shelter you made. What other current projects are you working on? I'm glad to see you aboard, you as Bill have been a great help yo me in my layout. I haven't got much going as far as Japanese N scale goes these days, but I'm still adding to the collection as much as I can. I'm still planning a mini-layout based on the Hakone Tozan Line, hopefully I can get started on that soon..! Welcome to the forum, glad to see you. On your layout you had a photo of one of your Bullets going through the tunnel portal. What I really liked was the curves you designed on the foam approaching the tunnel. (I liked so much I want to use your idea on this area of my layout. Here is a photo of where I want to give that curved look.) Can you post the photo? I love what your doing, that is really going to look good! Is that a Bachmann Acela in the last photo? If so, how do you like it compared to the Katos & Tomix trains? Don, that is great!!!! I love the smooth look of the tunnel. What tunnel is it modelled on or is it fictional? I'm still planning a mini-layout based on the Hakone Tozan Line, hopefully I can get started on that soon..! Nice work Cody! The Hokone Tozan Line is a fascinating little railroad. I had the opportunity to ride it in September 2006. I've considered modeling it also but with everything else I've got going on, it wouldn't be feasible. Thanks Bernard. That train is a Tomix Yamagata E3 series. Here is one at the Omiya station. The tunnel isn't any particular prototype location but I wanted to come as close as possible to the real Tohoku Shinkansen tunnel styles. Many Tohoku Shinkansen tunnels appear to be nothing more than concrete tubes. Bernard. This is inside the Under Sea Tunnel, but not a Shinkansen! This is probably more Bernard's speed! Especially the first one!! That second video really show Don's layout to be right on with his design! I know Don makes his own tunnel portals and they really blend with the "tube" design. I bought the WS concrete portals and are more "U" shaped than the "Circular" design that they in Japan. It interesting how Don came up with a way of making Japanese RR portals. Would you mind moving this to the Construction Platform and creating your own thread? This is too good of a layout design to leave here, I'm afraid it might get lost in this thread. It is something that other modelers would like to see develop and refer back to when building their own layouts. You're giving a great step by step demonstration. Just discovered your forum and thought I'd give it a whirl. I am 59, married and live now in Yorkshire although hailing from Scotland. I model in Japanese N but also in HO (USA and European), On30 and TT(continental)! I am now on my fourth Japanese N exhibition layout 'Katami Mittsu'. It's predecessor, 'Katamitu' was recently featured in the UK magazine Model Rail. oooooo! Pictures please if you have them in the Showing Off Board! Welcome to JNS and yes please post photos of your layout and tell us about it. If you also have photos showing the stages of development of the layout please post them in the construction platform. i live in the UK and have been collecting Japanese N gauge models for a couple of years but upto know I haven't got round to building a layout, mainly due to the size of area I've got in which to build a layout. Therefore I have decided to build a small 8x2ft layout mainly as a test piece until I find room to build a bigger one. Just can't make my mind up on what to model ! whether a small industry or a motive power depot I don't know. I have decided to use Kato track mainly to keep faith with using Japanese items. If anyone has any ideas of what to model or where I can find referance material then it would be very helpful to me. Nice to see you here Mark... especially for me as I too am british. Do you have any photos of your collection to post in the showing off area? Please feel at home here and any issues do not hesitate to PM me or Bernard. Welcome to JNS. Are you looking for ideas on a track plan? If so, take a look at this link, there are a lot of door plans or small layout designs but it might be the start of an idea and expand upon it.